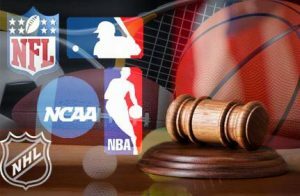 In a decision announced Monday, the Supreme Court of the United States (SCOTUS) cleared a path for states to legalize gambling on sports. In Murphy v. National Collegiate Athletic Association, the Supreme Court ruled that the Professional and Amateur Sports Protection Actviolated the 10th Amendment of the U.S. Constitution because it illegally empowered the federal government to order actions that prevented states from making their own regulations regarding sports gambling. The 10th Amendment to the Constitution, often referred to as the "anti-commandeering" amendment, is part of the Bill of Rights and expresses the principle of federalism and states' rights, stating, "The powers not delegated to the United States by the Constitution, nor prohibited by it to the States, are reserved to the States respectively, or to the people." In 1992, Congress passed The Professional and Amateur Sports Protection Act (PASPA), also know as the "Bradley Act,"named for then-New Jersey Senator and former NBA star Bill Bradley. The law prohibited state-authorized sports gambling on professional and amateur sports nationwide, with the exception of a few states, Oregon, Delaware, Montana and Nevada, that were granted "Grandfather" provisions, allowing for specific existing forms of sports gambling to continue in their states. In addition, Congress provided a one-year window of opportunity for states which operated licensed casinos for the previous ten-year period, like New Jersey, to pass laws permitting sports wagering. That did not, however, extend to all other forms of gambling like parimutuel horse and dog racing. New Jersey, therefore, decided to take a separate route. After voters approved an amendment to the State Constitution giving the legislature the authority to legalize sports gambling, the legislature enacted a law in 2012 doing just that. The law was challenged by the National Collegiate Athletic Association (NCAA), the National Basketball Association (NBA), the National Football League (NFL), the National Hockey League (NHL), and Major League Baseball (MLB) in 2012, arguing the New Jersey law violated PASPA and threatened the character and integrity of sporting events. Ultimately, the Third Circuit Court of Appeals found for the sports leagues, and enjoined the state from enacting the law -- but also ruled that PASPA did not prevent New Jersey from repealing any existing laws. "Congress can regulate sports gambling directly, but if it elects not to do so, each State is free to act on its own ... Our job is to interpret the law Congress has enacted and decide whether it is consistent with the Constitution. PASPA is not." Subsequently, in 2014, the New Jersey Legislature enacted a law repealing state-law provisions that prohibited such gambling "schemes," with the exception of sporting events involving state college events. The NCAA and major sports leagues again filed suit, and prevailed at the District Court and Third Circuit, but New Jersey (under the name of Phil Murphy, its current Governor) successfully petitioned the US Supreme Court, which accepted the case in June of 2017. The case was combined with a separate petition, NJ Thoroughbred Horsemen v. NCAA, representing commercial interests related to PASPA, and SCOTUS heard oral arguments in December, 2017. The 7-2 decision, as delivered by Justice Samuel Alito for the majority, ruled that parts of PASPA were unconstitutional as they commandeered power from the states, and in a 6-3 decision, determined that the whole of PASPA was unconstitutional. SCOTUS' ruling does not, in itself, mean that sports betting is now universally legal. 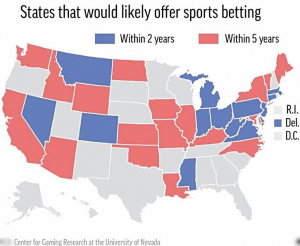 What is does mean is that individual states are now free to pass laws that would legalize sports gambling within their borders. The larger picture, however, is not about gambling itself, but about states' right to regulate themselves, and whether the federal government can compel state governments to take particular actions. Is it unconstitutional, for example, for the Trump administration to force state and local "sanctuary jurisdictions" to cooperate with federal immigration policy? We like to put out the word on unique campaign tools whenever possible, and this is the one of the better ones.